While all the talk this past year has been about tablets, we forgot all about how important smartphones are as part of the digital mix for a magazine brand. You know the device that used to be a phone but now has a web browser, email, touch interface, camera, app store etc.? I dug up some Canadian market research versus using USA market research so we can gaze into the crystal ball for a moment on what is happening in Canada. According to the Canadian Wireless Telecommunications Association (CWTA) 2012 study (sample size 2,011) smartphone adoption is now 48% of the 25.9 million cellphone users in Canada as of March 2012 with 31% of smartphone users also owning a tablet (Wow! this suggests that there are 3.8 million tablets in circulation in Canada). These figures indexed to the Canadian population show that there are 1.9 cellphones per household, based on a population of 34.5 million with 13.8 million households (2011 figures, source Canadian Media Digest). That’s a lot a cellphones or 75% of the population (FYI: 15% of the pop is < 15 of age), then you add all Apple iTouchs (aka- The mini-iPad, that kids are buying) in the ecosystem, you safely can say Canada is well-connected to the digital world. So what content is popular on the smartphone? 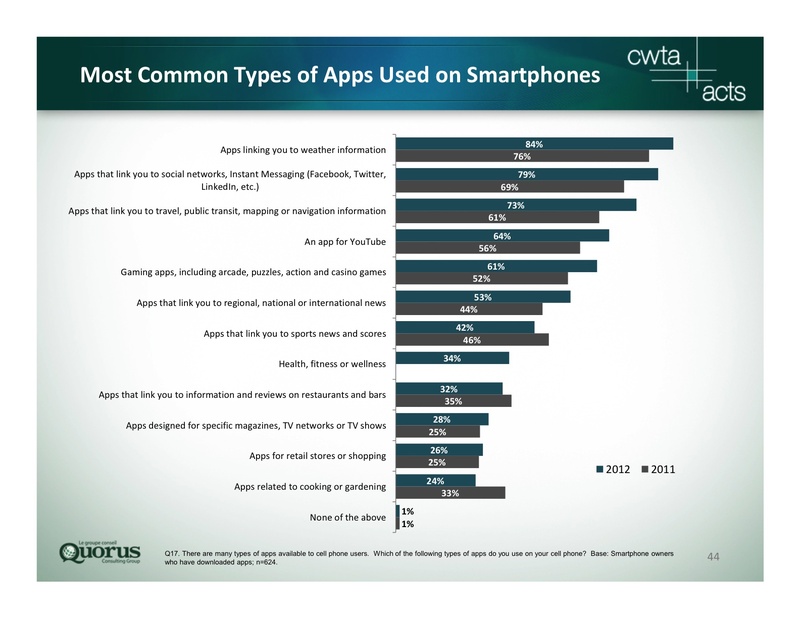 The same CWTA survey showed app download habits with weather apps as #1 followed by social networks, travel/mapping, YouTube, games, news, sports news, healthy lifestyle, night life, media apps (magazine & TV), shopping, and cooking & gardening. There is a lot of content categories that fit the needs of some magazine brands here don’t you think? 70% of canadian smartphone users have downloaded an app with a 12 app average. Compared to global average of 32, Canadians are not that app happy as the rest of the world as the global numbers suggest. Industry estimates of USA smartphone users show that the content access points are split between 85% app and 15% web browser. This differs from tablets users where the split is 60% app and 40% web browser. This discrepancy I feel is due to the lack of mobile-optimized content on a smartphone as traditional website designs are easier to read on a tablet than a smartphone, thus the higher use of the web on the tablet versus the smartphone. The website solution should be a priority for any publisher as it is the anchor to build the digital ad revenue ecosystem that includes email, banner ads, digital magazines and magazine apps. Advertisers have money to spend on email and banner ads so you better have some product ready for them to buy. Samsung Galaxy Q smartphone - What you can get today for $0 with a 3-year contract. This is the phone the normal person will get including myself. (Editor's note: We are still wondering if Martin is normal.) It has all the core functions you need - touch screen, texting, phone, email, browser and app store. It comes with a 3.2 inch screen, weighs 135 grams and runs on Android 2.2. Plus it has a pullout keyboard for easier typing. How is the magazine industry going to feed content into this ecosystem of 25.9 million people? What are the reader touch points — text message, email, website and/or magazine app, which do you choose or all four? And, can you do it profitably in two years? We know the replica version of your magazine is not the answer, as a 7” x 10” magazine does note scale well on a 3” screen. I have been preaching for the need to design for the medium as a golden rule for success. Publishers need to make it easier to read and navigate to increase reader engagement. The benchmark is that it must be more convenient than print. The promise of HTML5 might be the answer as it enables publishers to design a website for each device with a specific look and feel, but you can’t look like an amateur. You need some spit and polish to attract advertisers to differentiate yourself from the herd (so don’t go out and hire your neighbour’s son to build your website). I mentioned in an earlier blog posting there is an infinite supply of content on the web so your graphic branding and technical execution will need to stand out. Remember, if they can’t read your magazine you will not attract a reader and the ads will not work, so you will not get on a media plan when you are in competition with 10 other titles. Resist the temptation from the IT department to use free tools as that is what everybody else is using, invest in your brand and be different. What’s coming next? Mobile E-Commerce. The telco industry is working on the next generation of smartphone applications that will have M-Wallet attributes. 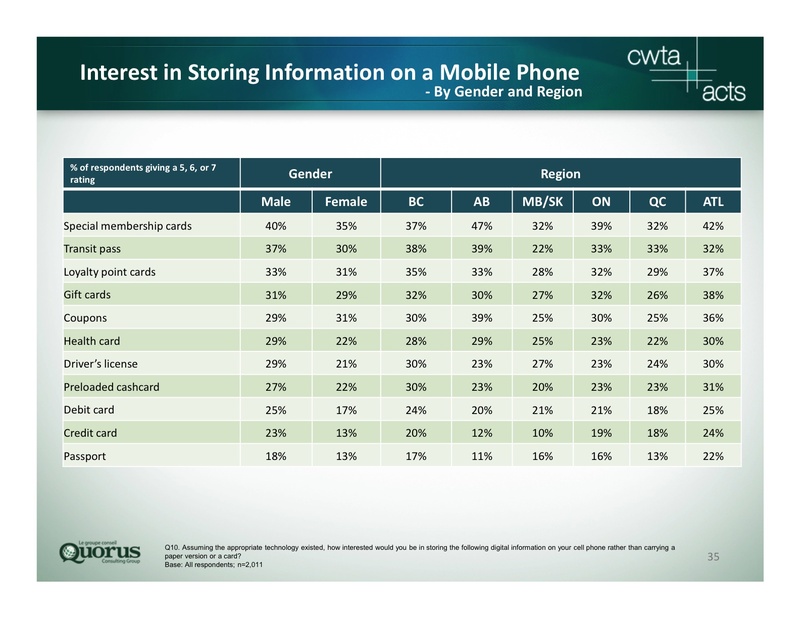 The CWTA research demonstrates that consumers are willing to have stored on their smartphone loyalty points cards, gift cards, coupons, membership cards and cash cards. These promotional devices perhaps can be used to a magazine publisher’s advantage with advertisers. The chart below provides additional details on what info may be on your smartphone in the future. Where’s the Money? According to IAB Canada in a 2010 ad revenue study, there are four sources of revenue for mobile users: SMS messaging (24%), banner ads (30%), key word search (33%) and branded content (10%) via website or app. Publishers can play in 3 of these established categories and supply free content to the search engines to drive traffic, but you better have a mobile-optimized website to take advantage of this opportunity.